Most back pain can be treated without the need for surgical intervention. It should be seen as a last resort and procedures are invasive and all surgeries carry risks including those related to the use of anaesthetics. 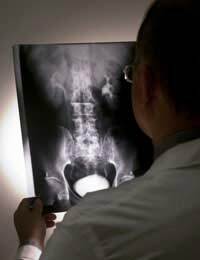 Surgery is mainly indicated for chronic back pain and fractures. There are two types of surgery involving the spine. Decompression and stabilisation.Decompression is usually performed on herniated discs that compress nerves of bony fragments that also cause compression.Stabilisation is performed for a spinal weakness. Herniated Discs. When an intervertebral disc becomes herniated the pain suffered can be quite severe and debilitating due to compression on the nerves. Spinal Stenosis. This occurs as a result of narrowing of the spinal canal usually as a consequence of bone overgrowth caused by osteoarthritis. Spondylolisthesis. This occurs when a vertebra becomes displaced causing the nerves to become pinched. Fractures. These can occur in any vertebra and are normally because of a trauma or as a result of bone weakness caused by osteoporosis. Degenerative disc disease. Accelerated or advanced ageing processes can cause the discs to have a high level of wear and tear. Spinal Fusion – The aim of spinal fusion is to unite two sections of bone, using metalwork including rods, screws, cages and sometimes the need for a bone graft is necessary. A one-level fusion involves two segments of vertebrae; a two level-fusion includes three vertebral components and so on. In order to fuse the vertebrae, the intervertebral disc must sometimes be removed. This surgery is indicated for problems with the joints, fractures or vertebra displacement. Mobility may be slightly affected post-operatively, depending on the location of the fusion. Discectomy – A discectomy can be either total or partial. It is performed to alleviate the pressure on nerves from a protruding or bulging disc. It is normally carried out under a general anaesthetic but can be done using a serious of injections of local anaesthetic. Advances in research have now introduced the use of prosthetic discs to replace the removed component. Laser Surgery – Laser surgery for back complaints is a relatively new treatment and involves the surgeon using a needle through which a laser is passed. The energy transmitted by the laser vaporises tissue. This treatment is offered for herniated discs. Vertebroplasty – A vertebroplasty is used in the treatment of fractures, usually caused by osteoporosis, metastatic disease or a myeloma. The surgeon stabilises the fracture with the use of a cement-like substance placed in the space where the fracture has occurred. IntraDiscal Electrothermal Therapy (IDET) - This therapy is used for herniated discs, and involves the surgeon passing a wire catheter to the affected disc and passing heat down the wire. The heat seals the disc wall and lessens the irritation to the spinal nerves. All surgical treatments should be thoroughly discussed by both the surgeon and the patient. Always ensure the surgeon is familiar with the procedure intended and has performed it before. If necessary ask for a referral to a different specialist. Recovery rates vary between patients and not all surgery is successful. Consent for spinal surgery must not be given until all facts for the surgery have been discussed.